Boxee see the future of internet TV, and the computer which began it all, is not part of that future. In fact, their latest release v.1.5 will be the last that supports the native PC. It seems that the future will be on mobile devices and via connected TV. The company say that the future of digital TV is changing, and of course it is. But it does seem a bit premature to isolate the PC audience as many see the PC as an essential portal into the TV online world. So the 1.5 release will be the last version that is available for PC, the Mac and Ubuntu. It can be downloaded via Boxee.tv until the end of January 2012. The news has not gone down well with the PC community that supported and promoted the service from it’s early days though. A quick look at the blog posting comments shows some real anger as hundreds of loyal users show their reaction to the news. The good news for PC owners is that the Boxee software is open source and a modification of the XBMC media player. 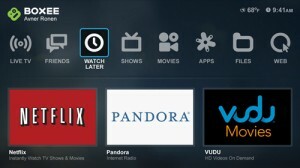 USers can download and modify the source code for the Boxee software release up to v. 1.5. So the chances are that the software will continue to be developed, just not by Boxee.